Let’s take some time to talk about something taboo: our toilets. Chances are if you’re reading this, the toilet closest to you is likely connected to a municipal water supply system. You go, you flush, and you forget about it. So the concept of a human-use plastic-bag toilet may not appeal to city slickers; but it’s a simple innovation that could help millions of lives around the world. Stockholm-based NGO Peepoople invented a “personal, single-use, self-sanitizing, fully biodegradable” toilet named Peepoo to tackle sanitation problems in developing countries. And one of the biggest hurdles facing the group is something else man-made: the stigma when feces, urine, and menstruation enter a conversation. The Peepoo bag design is remarkably simple: It’s a small bio-plastic bag containing six grams of urea powder – an organic compound that when it reacts with urine or feces, neutrailizing dangerous pathogens in a process called hygenisation. The bag eventually disintegrates and its contents break down into carbondioxide, water and biomass, creating a reusable nitrogen fertilizer. Peepoople’s simple solution to sanitation problems in the developing world. Photo: Peepoople. In Kenya, the bags are sold by local women in 28-packs and are priced around three cents per bag. For every bag returned at Peepoo drop-off points, one cent is refunded. “The design of the Peepoo is really a core part of the concept. You need to consider the appeal and attraction to get user acceptance,” said Ruiz in a statement. She explains the ideal reuse of the Peepoo is for food security, using fertilizer for crops. 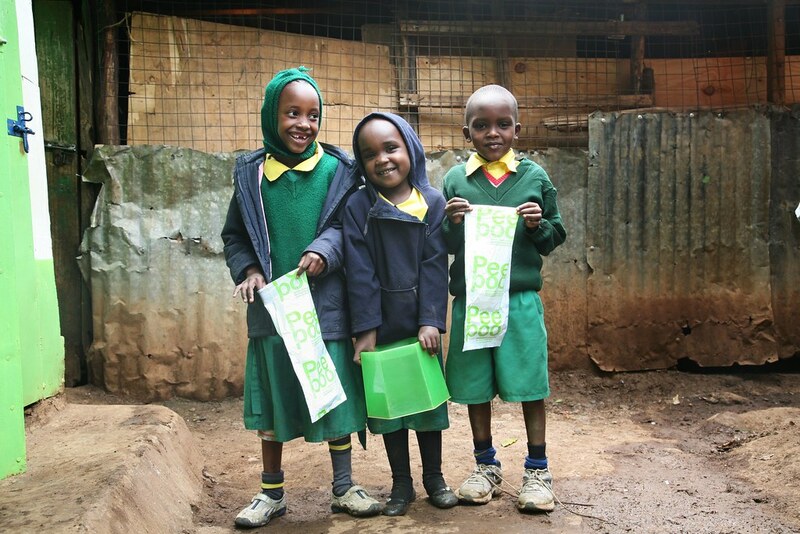 Children show off their Peepoo kit in Kenya’s Kibera slums. Photo: Peepoople. According to the United Nations, 2.5 billion people around the world don’t have access to sanitary toilets. It’s an issue that’s particularly problematic in slums, areas of the world where adequate plumbing and waste treatment facilities are not possible at the moment. It’s in these places where diarrhea-related diseases have the tendency to thrive, and water supply is often prone to contamination. Statistics collected from UN Water states 1,400 children die every day from diarrhea because of inadequate access to safe toilets and clean water. The human right to clean water and sanitation is a cause celebrities, most notably Matt Damon, have also worked to push to the top of global agendas. “In Kenya right now, where we have our biggest project, our school program is covering about 20,000 school children. And the plan is actually to reach out to 100,000 school children within the next three years,” she said. There's another important cultural nuances to consider: the lack of proper toilets put women and girls at risk of attacks and harassment due to the lack of privacy. In some parts of the world, public alleviation is so taboo for girls and women, they wait until after nightfall to go out to use outdoor facilities if they exist. In September, Peepoople Kenya received a $112,000 grant from Grand Challenges Canada, a Canadian government-funded non-profit, to study the impact of the Peepoo project over the next 18 months. The Peepoo bag is an example of outside-the-box thinking Sara Ilstedt, a sustainable design expert at the KTH Royal Institute of Technology, praises rather than pushing for Western flush toilets in areas with zero infrastructure to support them. “To look at problems from a completely new perspective … that’s what we need in the future,” she said.